ne major area of liability that surveyors face is the failure to identify and locate easements burdening or benefiting the property being surveyed. The difficulty arises for the surveyor when there are easements reflected in the records, but the easements are not created and conveyed by a deed. One source of an easement that arises by implication is an easement created by the description of a lot that references a subdivision plan. As a general rule, where 1) the deed conveys a lot in a subdivision, 2) the deed refers to the subdivision plan, and 3) the developer-grantor has title to the road, then the lot being conveyed receives a private, appurtenant easement in streets, alleys, and open areas shown on the plan.6 The easement created does not depend on whether the plat is recorded or the roads are dedicated for public use. The creation of an easement that is appurtenant to the lot caused by the mere reference of the plan in the deed gives rise to an easement by implication under the equitable doctrine of estoppel (a legal principle that bars a party from denying or alleging a certain fact owing to that party’s previous conduct, allegation, or denial). The courts reason that a grantor (developer) should not be allowed to use a subdivision plan to entice a buyer to purchase a lot without implicitly assuring the buyer that the buyer and his or her heirs and assigns have free and perpetual use of all the roads and other proposed uses shown on the plan. This is true in many states regardless of whether the buyer actually needs the road or other use to reasonably enjoy his or her lot. Consider Figure 1, the diagram of a subdivision plan that is cited in the 1946 deed for Lot 3 (e.g., “Lot 3 as shown on the Sunset View Subdivision”). Even though Lot 3 does not require any of the subdivision roads for access, in many states Lot 3 has an appurtenant easement in Apple Road and Twig Lane. Once the appurtenant easement attaches to the lot at the time of the first conveyance, the easement does not have to be mentioned with the subsequent conveyance of the lot to remain appurtenant to the lot. Consequently, a 1964, 1982, and 2010 conveyance of Lot 3 in Figure 1 continues to include an easement in Apple and Twig roads even though there is no mention of the appurtenant easements in Apple and Twig roads. Once you understand the concept of the creation and the extent of the implied easement, you can realize the ramifications involving the surveyor’s services. 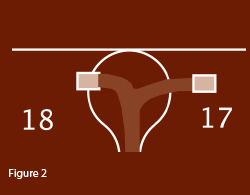 Using the previous example, consider the situation where the owner of Lot 18 built his or her garage as shown in Figure 2. If the surveyor has agreed to survey Lot 3, the surveyor may be obligated to show the possible encroachment of Lot 18’s garage in the cul-de-sac as an encroachment on Lot 3’s appurtenant easement. Unless the surveyor has agreed to limit his or her services or a state’s common law has taken a narrow view of the implied easement, it could be argued that the surveyor is obligated to drive all the roads and other apparent easements in the subdivisions looking for an encroachment. The broad language in Massachusetts’ 250 CMR Sections 6.01 (2)(a)(1) and 6.04 (1)(c)(1) is the sort of language that could create such a burden on a surveyor. Another common situation causing confusion leading to surveyor malpractice is for the government to discontinue the public easement in the subdivision road. Where this situation has occurred, lot owners would tend to believe that the portion of the road discontinued by the government is no longer burdened by an easement. However, as this article explains, even if the public road is discontinued, a private easement will often remain in the former public road. This situation is one of several easements that may be reflected in the records but not found as a separate deed for the easement. Surveyors would be wise to research this particular implied easement in your state in order to understand the extent of the easement and properly provide the services you have contracted with the client. 2011 Minimum Standard Detail Requirements For ALTA/ACSM Land Title Surveys Table A, Item 20a. See 25 Am Jur 2d Easements and Licenses in Real Property § 21. See also 7 A.L.R.2d 597. In Massachusetts this notion was articulated in Downey et al. v. H.P. Hood & Sons, (203 Mass. 4, 89 N.E. 24) and as further distinguished on the point of material benefit in Gray v. Howell (292 Mass. 400, 198 N.E. 516). In addition, a 2004 Massachusetts Supreme Judicial Court (SJC) case, M.P.M. Builders, LLC v. Dwyer (442 Mass. 87, 809 N.E. 2nd 1053), which effect appurtenant easements generally and is worthy of mention as it affects implied easements as well as those created by express grant. This case went even further by providing a process whereby the owner of a servient estate can unilaterally move an easement under certain conditions. This case tackled the conflict land surveyors often see when a seemingly superfluous easement in a fixed location on the ground prohibits the servient estate owner from full use and enjoyment of their land. Not only are surveyors bound to understand the different types of easements that exist, and how such easements may have been created, but they are also expected to know how the law’s treatment of them changes.